If I could wake up each morning and put on a set of false eyelashes, I would. But I don't have time for that! So I simply curl my lashes and plump them up by wiggling the mascara wand from left to right. Yet there's still a part of me that longs for that '60s doe-eyed look. You know that kind of seductive stare made complete with wispy lashes and winged-out eyeliner that Twiggy, Diana Ross and Jane Birkin were all known for? Well British "It Girl" Alexa Chung must have gotten my memo, as she's teamed up with cosmetics brand Eyeko to make my dreams come true. 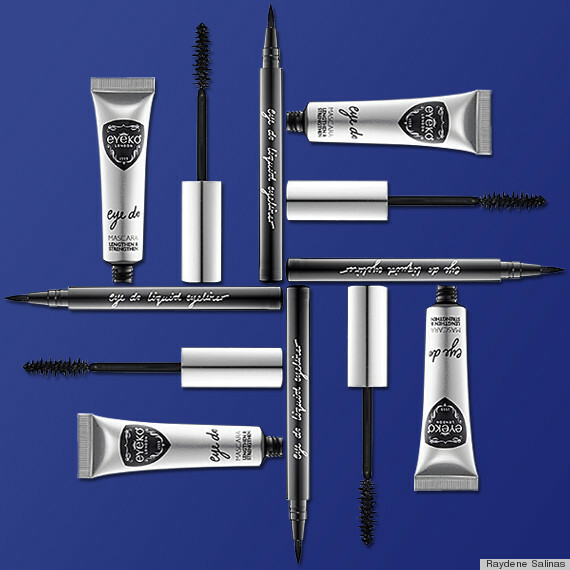 Chung's makeup set includes a felt-tip liquid eyeliner and carbon black mascara -- the essentials to creating her signature cat-eye. Both products are packaged in sleek and small tubes that fit perfectly into your pocket or handbag. What I love most about the waterproof eyeliner is that it's slightly smaller at the base than at the top of the bottle, which allows for a firmer grip during the application process. The liquid felt cool against my skin; it went on smooth without leaving behind streaky marks and didn't smudge. (I'm pretty sure this is the closest I've ever gotten to my lash line.) Because the point of the pen is so fine, it was also easy to perfect that feminine flick without error. The over-size mascara wand that miraculously fits inside a tiny silver tube also took me by surprise. I was able to skip the eyelash curler and rely on the mascara's thick bristles to curl and coat each of my lashes. How's that for saving time? Once I took a step back from the mirror and saw how it all came together, I was speechless. My 1960s-inspired eye makeup looked like it was done by a pro. And I'm not too proud to brag! Rating: 5 out of 5. You'll have a hard time finding a mascara and eyeliner set at this cost with outstanding results.